This Trailer has been SOLD. Another new one will be available soon. Willing to Build to all customer specs. Battle Wagon 3 bunk Drop Frame with Dovetail. 46'x 102". 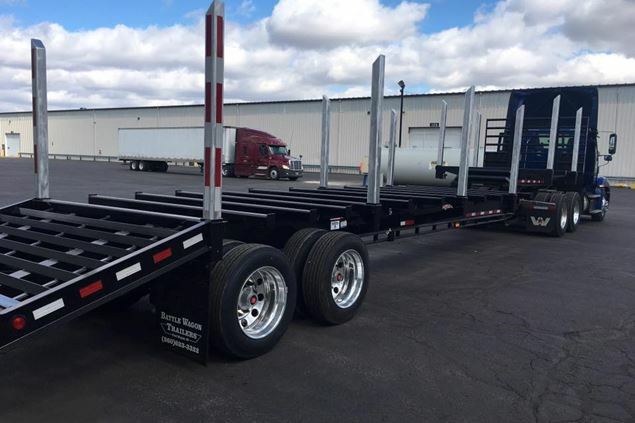 Air ride, 6' Aluminum stakes (60" out), all removable with stake storage on sides of trailer, Air Scales with manual dump valve kit, 3 winches and straps per bunk, steel chain box, bulk head, Firestone FS 255/70 22.5 tires on steel pilot hub rims, Large axle bearings. UPGRADES: aluminum rims if desired. Contact Todd Detweiler at 574-205-9565 for pricing.